When President James Monroe announced in his 1824 message to Congress that, barring an emergency, the large public debt inherited from the War for Independence, the Louisiana Purchase, and the War of 1812 would be extinguished on January 1, 1835, Congress responded by crafting legislation to transform that prediction into reality. Yet John Quincy Adams,Monroe’s successor, seemed not to share the commitment to debt freedom, resulting in the rise of opposition to his administration and his defeat for reelection in the bitter presidential campaign of 1828. The new president, Andrew Jackson, was thoroughly committed to debt freedom, and when it was achieved, it became the only time in American history when the country carried no national debt. 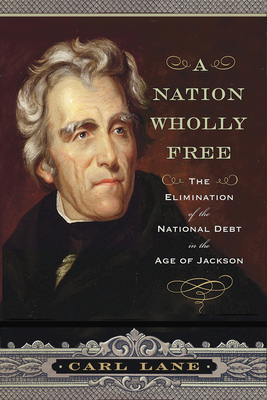 In A Nation Wholly Free: The Elimination of the National Debt in the Age of Jackson, award-winning economic historian Carl Lane shows that the great and disparate issues that confronted Jackson, such as internal improvements, the “war” against the Second Bank of the United States, and the crisis surrounding South Carolina’s refusal to pay federal tariffs, become unified when debt freedom is understood as a core element of Jacksonian Democracy. The era of debt freedom lasted only two years and ten months. As the government accumulated a surplus, a fully developed opposition party emerged—the beginning of our familiar two-party system—over rancor about how to allocate the newfound money. Not only did government move into an oppositional party system at this time, the debate about the size and role of government distinguished the parties in a pattern that has become familiar to Americans. The partisan debate over national debt and expenditures led to poorly thought out legislation, forcing the government to resume borrowing. As a result, after Jackson left office in 1837, the country fell into a major depression. Today we confront a debt that exceeds $17 trillion. Indeed, we have been borrowing ever since that brief time we freed ourselves from an oversized debt. A thoughtful, engaging account with strong relevance to today, A Nation Wholly Free is the fascinating story of an achievement that now seems fanciful. CARL LANE is professor of history at Felician College in New Jersey. He received his Ph.D. in history from the Graduate Center of the City University of New York. His articles have appeared in William and Mary Quarterly, Virginia Magazine of History and Biography, and other publications. His article “The Elimination of the National Debt in 1835 and the Meaning of Jacksonian Democracy” in Essays in Economic and Business History won that journal’s James Soltow Award. He and his wife live in Montclair, New Jersey. Historian Lane delivers a superbly written exploration of a narrow subject in the fading past, making it feel surprisingly relevant to modern readers. Paying off the national debt, a topic that’s at the center of passionate debate today, similarly roiled the political scene 175 years ago. Lane describes how, under vastly different conditions, Andrew Jackson and his administration vowed to completely eliminate the national debt by 1835. They succeeded, but in the process were forced to bow to ideology and political pressure, killing the Second Bank of the U.S. and unwisely distributing surplus federal funds to state banks rather than using the money for infrastructure development. The result, according to the author, was the crash of 1837—America’s first great financial crisis. Lane brings life to the dry topics of debt, tariffs, taxes, and banks, and he’s not above calling participants to account when he thinks criticism is warranted. His only error is holding figures of the past to today’s standards. Otherwise, this is first-rate history rendered with unusual clarity and verve.